Note: Buttplate and screws not shown. Offered as a simple reliable arm at low cost, the Remington Model 514 .22 rimfirc single-shot rifle was introduced in 1948. This turnbolt takedown rifle fires .22 short. long, and long rifle regular and high speed cartridges interchangeably and without adjustment. It was initially offered in a 514A version with open rear sight and a 514P version with an aperture rear sight on the receiver. Both have a 24%" round barrel and a one-piece walnut stock. Several changes were made in the Model 514 through the years. The 514P version was discontinued, and the barrel length of the 514A was reduced to 20". A 514 BC Boy's Carbine version with 20" barrel and a stock one inch shorter than that of the 514A was also offered, but was discontinued after several years. Current versions of the Model 514 are the 514A with 24" barrel and the 514BR Boy's Rifle with 24" barrel and a stock one inch shorter than that of the 514A. 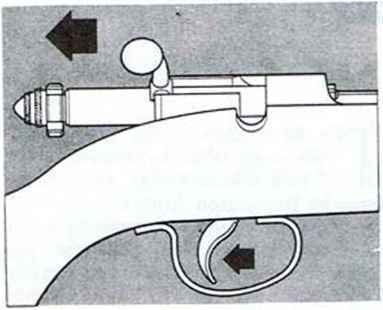 6 Rifle is on safe when safety is rotated to right (clockwise) about Vs of a turn. The red safety indicator (A) is then concealed. Safety is in fire position when red indicator is visible on right side. ILift bolt handle and pull bolt assembly (3) rearward. Check chamber to make sure rifle is not loaded. 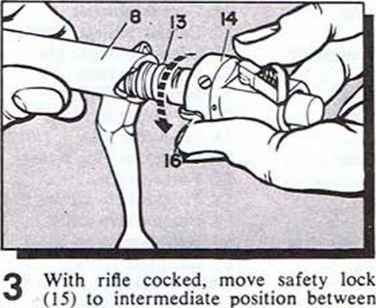 Pull trigger (14) and remove bolt assembly from rifle. 2 To disassemble bolt assembly, push and hold safety (28) forward against tension of mainspring (27), and unscrew safety screw (29). Slowly release forward pressure on safety and remove safety from bolt (19). Remove mainspring. 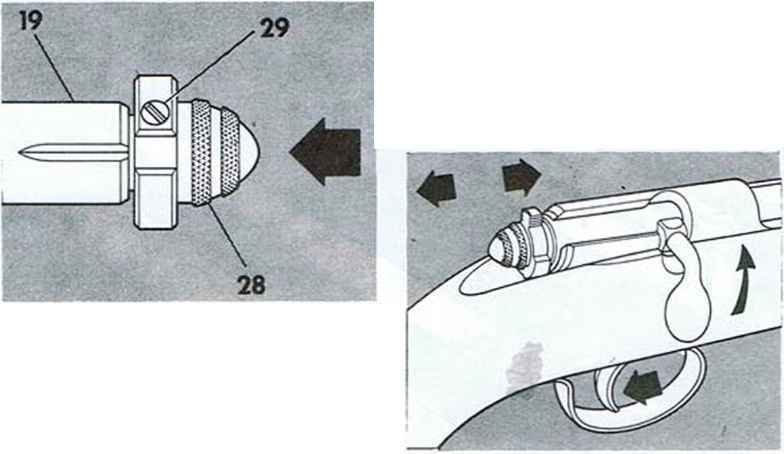 Drive out ejector pin (21) and remove ejector (20) and ejector spring (22) from face of bolt. Disassembly of extractor (23) is not recommended unless necessary for repair or replacement. Force small screwdriver or knife blade between extractor and extractor plunger (24), and push plunger rearward. Pry extractor out of its slot in bolt. CAUTION: Extractor plunger is under spring load and may fly out of bolt with force when extractor is removed. Care should be taken to prevent this. Remove extractor plunger and spring (25). 4 Drive out trigger pin (17). 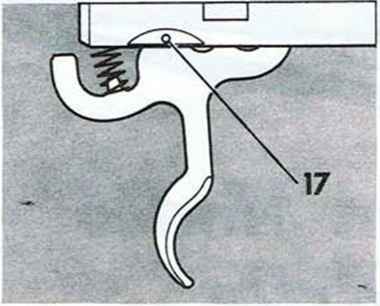 Remove trigger, trigger spring (18), bolt detent retainer (5), and bolt detent ball (4). Use care when disassembling these parts since retainer and ball may fall out of receiver when pressure of trigger spring is removed. NOTE: When reassembling safety to bolt, make sure that safety screw is screwed into safety as far as possible. 5 Tension should be relieved from mainspring when rifle is not in use. 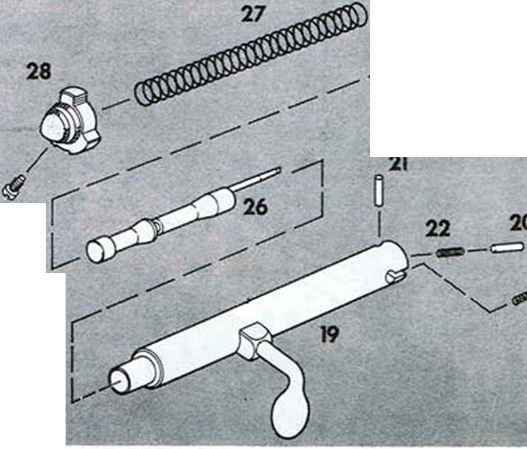 This is done by lifting bolt handle and allowing bolt assembly to travel rearward approximately After making sure there is no cartridge in chamber, hold trigger rearward and move bolt assembly forward approximately Va". Release trigger and close bolt. 3 Unscrew takedown screw (12) until action can be lifted from stock (11). Leave screw in stock to prevent loss. What is inside magazine assembly for remington model 24? How to remove the bold from a remington .22? How to disassemble remington model 514 22 rifle? How to unscrew the ball on a rifle bolt? What are the parts to a rifle bolt? How bolt action rifle extractors work? How to make ejector firearm? How to attach a remington model 514 barrel to receiver? How long should the bolt main spring be in a remington model 514 rifle? How to install ejector plunger in remingtio 514?